We want to be a church of small groups. Why? We believe that God created us to grow together as we grow closer to Him. We want our groups to be great places to make new friendships and learn more about God and His insights in our lives. If you have never been in a small group, rest easy: our groups are designed to be simple to join, easy to connect with, and quick to build relationships. Each group is a little different. Some of our groups meet in the mornings, but most meet in the evening. Some of our groups are designed for couples, some are for men only, some are for women only. Some groups will eat dinner together every week, some don’t. Some of our groups are “sermon-based” which means they go deeper into the theme/topic of the sermon from the prior Sunday, while other groups study other topics, books of the Bible, etc. 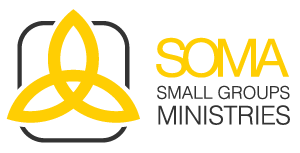 If you want to better connect at Soma, if you want to find some “journey friends” who are fellow Christ-followers that will actually journey through life with you, and if you want to grow in your faith, join one of our Small Groups. You can use the form on this page to seek more information, or visit our Welcome Table in the lobby on Sunday morning, or call the church office, and we will help you find the group that would be the best fit for you. For more information about finding the right small group for you, use the form on this page. Looking for Your Small Group?